What do Purple Hearts and cotton candy have in common? Not much, unless you consider the confection’s potential health impact. Actually, there is a connection, and it will be on full, festive display in Frisco on March 28, with the grand opening of the Inaugural Frisco Fair, hosted by Frisco Fresh Market. Frisco Fresh Market and the Frisco Veterans Advisory Committee (FVAC) are collaborating to support Mayor Jeff Cheney’s initiative to “honor, celebrate, and award Frisco’s Veterans for the contributions to our country, and leverage their talent to strengthen our community and local businesses,” reads the group’s mission statement. 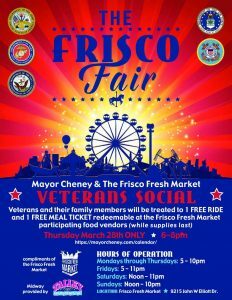 The event is another edition of Mayor Jeff Cheney’s Veterans Social, designed to honor and engage the over 3000 veterans that call Frisco home. The FVAC was established to take the city beyond a “veteran-friendly” community to a “veteran-ready” one, where those that served can contribute to Frisco’s economic and cultural growth. It’s also an opportunity to increase awareness and appreciation for the contributions veterans have made to the community, FVAC organizers say. The FVAC invites veterans and their families to RSVP here. …step right up and have a ball! The Inaugural Frisco Fair will be an eleven-day, family-fun event with the best in class rides, foods, and family entertainment. The Midway will feature kiddie rides, family rides, and even THRILL rides, all provided by Talley Amusements (who provide some of the best amusement rides in Texas). And as always, your favorite vendors at the outdoor market will be around to showcase their unique specialties, from produce to jams and jellies, wine, woodworking, jewelry, confections, popcorn, nuts…you name it. Never been to Frisco Fresh Market before? Check out this overview from their 2018 grand opening featuring details, a photo slideshow, and a VIDEO TOUR!